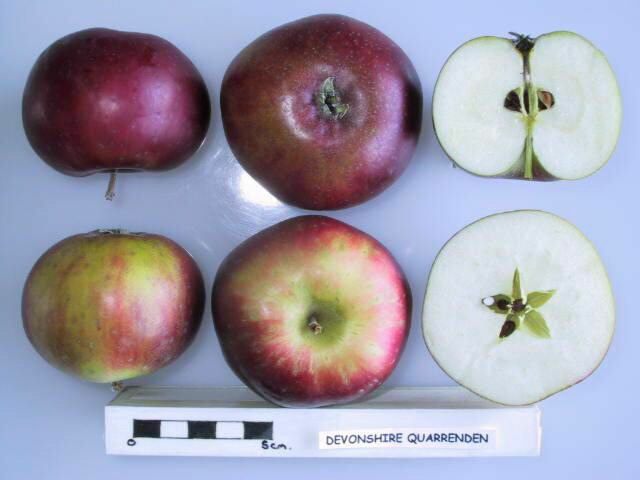 Devonshire Quarrenden is a very old English apple variety, thought to have orginated from south-west England, but quite widely grown in Victoria times. 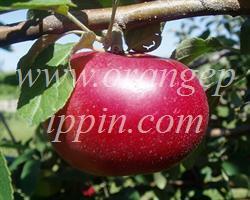 It ripens very early in the season and does not keep. it has remained popular because of the distinctive strawberry flavour which can be discerned in some examples - although in our experience it can be elusive and very dependent on the time of picking. This strawberry note is an interesting example of the diversity of flavours that can be found in apples, and can sometimes be found in its offspring, of which Worcester Pearmain is the most well-known. Devonshire Quarrenden also has a tendency for the red skin to bleed into the flesh slightly, and it may occasionally have red flecks within the flesh. As an update - I had no crop in the 2012 crop but a good crop in 2013. This year, there is again no crop. The variety appears to be showing some fairly strong biennial behaviour. The growth habit with no pruning is very upright. 2013 fruits were very small. Taste is vinous rather than aromatic and while incomparably better than shop bought Golden Delicious is still disappointing against the likes of a Claygate Pearmain, lacking any real depth or complexity of flavour. A decent early variety but not outstanding. I planted one of these in 2011 and it blessed me with a couple of fruits. I probably should have allowed it but couldn't help myself. The texture of this apple is not crisp, it rather melting and the flavour is delicate rather than strong, even perhaps slightly watery. You need to close your eyes and concentrate on the flavours which are complex but lacking in intensity. Attractive slightly flattened apples. Good for an early and ready several weeks before the Discoveries hit the supermarket shelves, but it wont keep. Not that thats a problem since I'll scoff the lot within a week anyway.